Kuzma Petrov-Vodkin is a Russian artist who painted in the spirit of symbolism, using for his paintings some images from Russian folk tales – animals, people in unusual circumstances. Spectators of the last century know the artist as the author of the painting Bathing a Red Horse, popular in the Soviet Union, but the creator had many other remarkable works, one of which is the painting Behind the Samovar, written in 1926. The picture in the foreground shows a girl – a woman in a light, revealing full arms and a beautiful swan neck blouse. The girl’s hair is pulled back and curled into a tight hairstyle. The body of the girl is only half visible to the viewer, one hand is attached to the chest, while the other rests on the back of the chair. Behind the girl’s back is a served table covered with a blue tablecloth. The main place on the table and practically in the whole center of the picture is occupied by a big brilliant samovar, around it there are glasses and cups of hot tea. 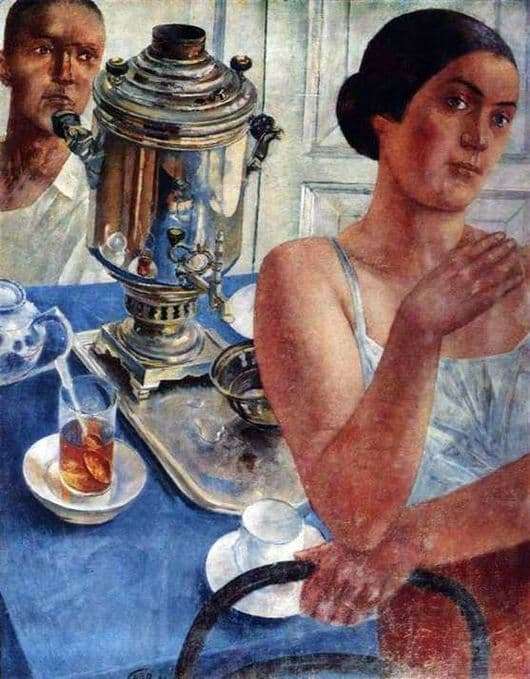 Behind the samovar, the viewer can clearly see the face and figure of the second participant of the tea party, whose thoughtful appearance indicates that the people gathered around the table and visible to the viewer are not the only ones in this room. Most likely, there is a third interlocutor, whose story they gathered with great attention and interest to listen. This is also indicated by the pose of the girl who turned away from the table and stood waiting. You can also see the reflection of the third person present in a polished samovar polished to a shine, which in the pre-revolutionary era it was customary to reach only on special occasions, which, it seems, is the arrival of a guest. Since the artist is still an adherent of symbolism, then the presence in the picture of a third person is also indicated by such detail as a clearly traced door, which has always been a symbol of the designation of the arrival of a new character, both in painting and in other forms of art.